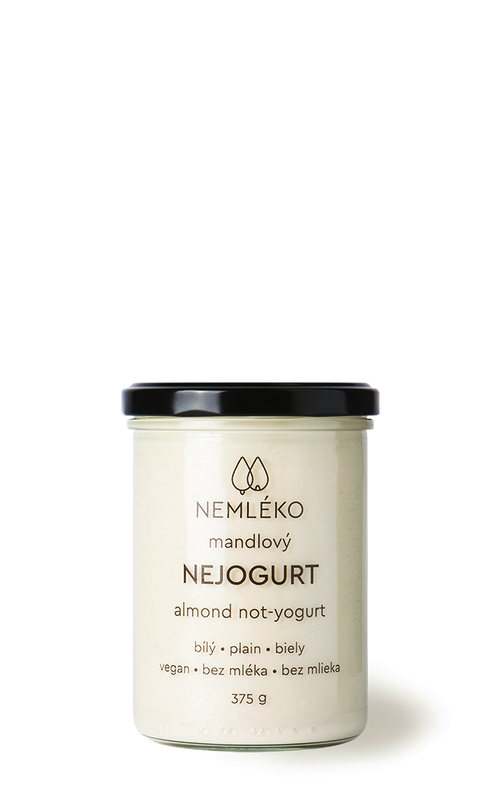 Nejogurt is the first Czech vegetable yoghurt made of almond milk – Nemléko. It doesn’t contain any lactose, soya, gluten or sugar, but is full to the brim of beneficial live yoghurt cultures. And since it contains a truly large amount of almonds, it has a rich, creamy taste. The plain almond Nejogurt is an excellent choice for breakfast with fruit and granola, or in salty style as tzatziki. It isn’t sweet, has a creamy taste and is just the right kind of sour. Without sugar, gluten, soya or any other unnecessary additions, thickened with only a slight amount of tapioca. Composition: almond drink (filtered water, almonds 20%, dates), tapioca starch, live yoghurt culture (S. thermophilus, L. acidophilus).